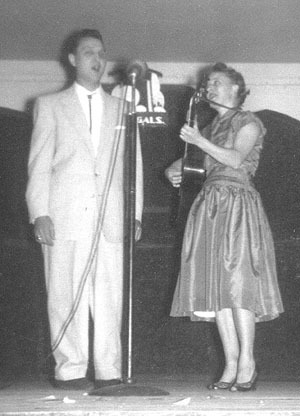 Ed Marlo and Rose Weygandt singing! The .wav files take a few minutes to download, but it's worth it. Be patient. Go to the bathroom! The audio quality is not great. It is taken from the original reel-to-reel recordings transferred to cassette. Ed and Rose sing "Sioux City Sue"
Ed and Rose sing "Good Hearts and Gentle People"
Ed and Rose sing "Oh, Baby Mine"
Ed and Rose sing "Goodie Goodie"